NEW! Gridiron Giveaway! 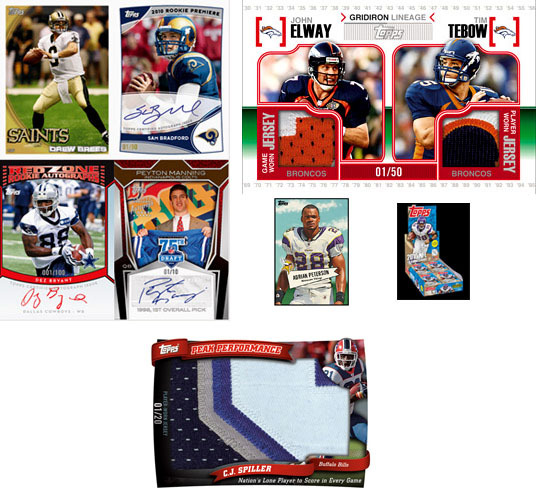 - Consumers can win ORIGINAL vintage Topps Football cards and other prizes including signed memorabilia from the fabled Topps archives, when they uncover code cards inserted 1:6 packs. NEW! NFL Draft 75th Anniversary Cut Signature Cards! NEW! 1952 Bowman Football Card Retrospective! NEW! Red Zone Rookie On-Card Autographs! NFL Rookie Premiere On-Card Autographs! 1 Autograph OR Relic Card per Hobby Box! 2 Autographs and 1 Relic Card per Jumbo Box! Hobby Exclusive 1/1 Sketch Cards! Topps' first football card product of 2010 features the top 110 NFL Rookies from this year's draft in their new NFL uniforms, as well as a host of new inserts like NFL Draft 75th Anniversary, 1952 Bowman, and Red Zone Rookie cards. 2010 TOPPS MAGIC FOOTBALL BOX 3 AUTOGRAPHS PER BOX!! 2010 Topps Chrome Factory Sealed Football Hobby Box Gronkowski Tebow RC's ?? The rookie premiere cards look great, but there are just too many inserts.